Assam Chief Minister Sarbananda Sonowal said that joint effort by the Government and public is must for riding the society from superstition and other forms of social evils. Chief Minister Sonowal said this while taking part at the Mahila Samaroh held at Kheroni High School playground, Kheroni in West Karbi Anglong under Diphu parliamentary constituency on Thursday. The Mahila Samaroh was organized by the Panchayat & Rural Development Department under the aegis of Assam State Rural Livelihood Mission. Stating that there is no place for superstition in the twenty first century world, Chief Minister Sonowal underlined the role women could play in riding the society from this social menace. He said that the women in our society would have to guide their children in the path of righteousness and imbibe moral and spiritual values amongst them and build their personality. He also emphasised more active role by the women in developing scientific temperament amongst the youth. Highlighting the immense tourism potential of Karbi Anglong, West Karbi Anglong and Dima Hasao districts, the Chief Minister called for committed efforts to reap greater dividends. He exhorted the local people to follow the mantra of ‘Atithi Devo Bhava’ to draw higher tourist footfall in the districts and earn a distinct identity for the districts in the tourism map. 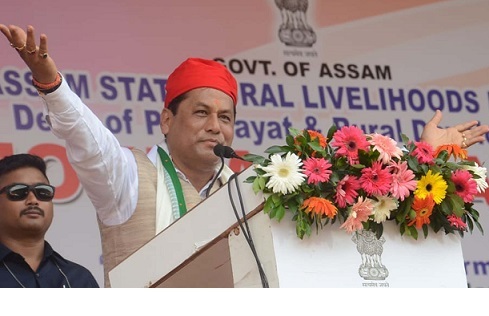 Sonowal also underlined the government schemes being implemented in education, health, industry, social welfare, agriculture and other sectors to unleash a new era of development in the hilly districts. Further saying that the State Government has adopted various measures to ensure equitable development in the state, the Chief Minister informed that several irrigation projects have already been taken up in the three districts for higher agricultural yield. The CM also said that surface communication in the hilly districts would also receive a major facelift soon and made a call to the people to take active part in the development narrative of the region. Reiterating State Government’s commitment to strictly deal with all subversive forces, Sonowal said that violence has lost its foot hold in the hilly districts as a result of State Government’s dedicated endeavours and peace reigned over the entire region now. Further stating peace as a primary requirement for development, he informed that steps are afoot to market ginger, turmeric and other agricultural products of the districts in a more organized way. He, moreover, informed that the Government under ‘Soubhagya Achoni’ would provide electricity connection to 26 lakh families. Besides, four LED bulbs each would be provided to 52 lakh families in the State under the scheme, he added. He also said that training centre for ACS officers, which is under construction at Umrangso in Dima Hasao would be developed as one of the leading institutions of the country. Minister of Finance, Health, PWD Dr Himanta Biswa Sarma in his speech reassured the gathering that the State Government would fulfil the promises made to the people of the hilly districts during the election. He also informed that the Government would release Rs 10 crore each to all the 26 constituencies of the Karbi Anglong Autonomous Council (KAAC) and another Rs 100 crore fund for improvement of roads in the three districts. Dr Sarma also mentioned that two cancer care centres would be set up by the state government at Diphu and Haflong and two other 200-bedded hospitals at Hamren and Bokajan. He further said that the Government would provide old age pension to all senior citizens of the state irrespective of their financial condition who have attained sixty years or above as part of universalization of the old age pension scheme in the state. Coinciding the Mahila Samaroh, Chief Minister Sonowal ceremonially distributed cheques of revolving fund amounting to Rs 25,000 each under Kanaklata Mahila Sabalikaran Achoni to twelve SHGs. Under this scheme, 5037 women SHGs of the three districts would be provided revolving fund to the tune of rupees twenty five thousand each. Mines, Minerals and Hills Areas Development Minister Sum Ronghang, Minister of State for Panchayat & Rural Development Naba Kumar Doley, MLA and Chairman of HOUSEFED Ranjeet Dass, Chief Executive Member of KAAC Tuliram Ronghang, CEM of Dima Hasao Autonomous Council Debolal Garlosa, MLAs Dr Mansing Rongpi, Dr Nomal Momin, Joyram Engleng, Deputy Mayor of Gauhati Municipal Corporation Bijulee Kalita Medhi, several Executive Members of both the autonomous councils and other dignitaries were present in the programme.